TORONTO -- Trading on the Canadian Securities Exchange soared to a record high in 2017 -- with a more than 400 per cent year-over-year spike in the overall value traded -- thanks to a surge of marijuana-related listings and the buzz around blockchain technology, its chief executive said. Richard Carleton, the CEO of the CSE, said Thursday that the total value traded surpassed $7.81 billion in 2017, an increase of more than 403 per cent from $1.55 billion a year earlier. Meanwhile, the volume of shares that traded hands on the alternative exchange in 2017 hit 17.4 billion, up 171 per cent from more than 6.4 billion in 2016. "It was largely driven, but not exclusively, by the cannabis space," Carleton said in an interview. "But later in the year, we did have a number of companies with blockchain applications." The CSE finished 2017 "with a bang," he added, as Dec. 28 marked the biggest trading day of the year. On that day, some $388.9 million and nearly 456 million shares changed hands -- with 82.6 per cent of the volume being marijuana related. Another eight per cent of the volume traded on Dec. 28 involved companies with interests related to the technology underlying the cryptocurrency bitcoin, Carleton said. The other two most active companies, by value, last year were blockchain-related fintechs Glance Technologies Inc. and NetCents Technology Inc. The smaller exchange has benefited from a rise in interest in marijuana companies as Canada moves closer to a July 2018 deadline for legalizing the recreational use of pot. But the CSE's relatively more permissive stance regarding marijuana companies with exposure to the U.S. -- where cannabis is decriminalized in several states but remains an illegal substance under federal law -- has been a draw as well. Many Canadian marijuana companies had largely dealt with the hazy legality by focusing on international markets outside of the U.S. or listing on the less risk-averse CSE. 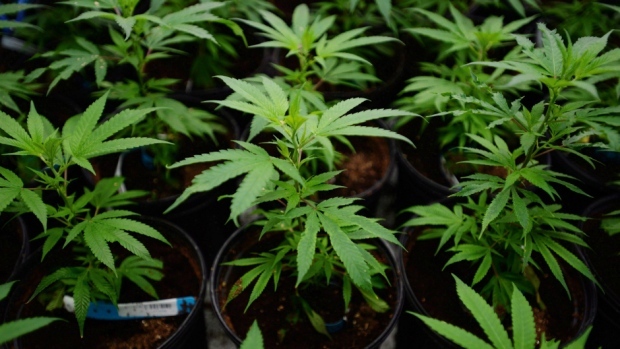 This approach was further reinforced in October, after the TMX Group -- which operates the Toronto Stock Exchange and the TSX Venture Exchange -- warned that companies with business activities that violate U.S. federal law regarding marijuana could undergo a delisting review. On the same day, the Canadian Securities Administrators, the umbrella organization for the country's provincial and territorial securities regulators, issued a staff notice saying that cannabis companies must disclose to investors about certain risks when they invest south of the border, in alignment with the CSE's approach. Also that month, Constellation Brands signed a deal to acquire a nearly 10 per cent stake in Canopy Growth Corp. (WEED.TO) for $245 million, marking the first major wine, beer and spirits producer to invest in legal cannabis. It marked a "watershed" moment for the Canadian cannabis industry, sparking a flurry of transactions, said Carleton. And by the end of 2017, 56 out of the 300 issuers on the CSE were marijuana related, representing 63 per cent of the overall market cap and 54 per cent of the total CSE listed trading volume, he said. Sixteen of those cannabis securities have U.S. interests, Carleton added, nothing that he anticipates "more than a handful" of marijuana-related listings in the coming months. "We know of a number of companies that are headed our way who are in the final stages of clearing documents with securities regulators," he said. Meanwhile, the number of blockchain-related securities on the CSE skyrocketed to 24 last year, compared to just one in 2016. These companies accounted for 14.4 per cent of the total traded volume on the exchange, compared to 0.04 per cent a year earlier. Carleton said the CSE and securities regulators are taking a close look to make sure companies' disclosures related to blockchain are factual and not just "riding the wave" of the blockchain hype. "We want to make sure that the companies that are putting blockchain in press releases and so on, that they really are pursuing a business venture ... that uses the technology or an application for the technology."